Shimgyachi Holi (Konkani name for "Holi") is a famous festival celebrated in every state of India, but each state has different way and tradition for celebration. One of the popular traditions of Holi celebration can be observed in Konkan region. That’s the reason, why thousands of people visit Malvan to be a part of the Holi festival and experience the enjoyable Holi celebration. It is estimated that this year’s Holi celebration in 2012 is going to attract a record breaking visitors to Malvan. There are number of stories and myths behind the tradition of Holi Festival, but the one that is more popular is the legend of Bhakt Prahlad's victory and the defeat of his aunt 'Holika'. It was the day, when a mighty demon king Hiranyakashyap, also the father of Bhakt Prahlad, planned to kill his son with the help of his sister Holika. Bhakt Prahlad was a great follower of Lord Narayana, which was opposed by his father. Prahlad’s aunt Holika was blessed with a boon, due to which she was prevented from any destruction of fire. Hence, Hiranyakashyap made a plan instructing his sister to sit on fire with his son. However, the opposite happened, Prahlad survived and Holika was charred to death. 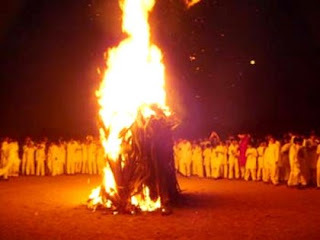 Thus Holi is celebrated to honor the victory of virtue over evil by burning statute of Holika also known as Holika Dahan. Usually a log of woods is kept in a public place considering as a replica of Holika. Later this replica of Holika is burnt and prasad (coconut and sweet) is distributed to the people. One the second day people play with colors, it the festival of holi is popularly known as the festival of colors.